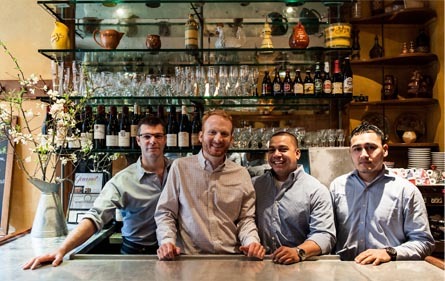 Everything's right at this petite West Village Francophile's dream bistro where meticulously prepared Provençal dishes come via a superb staff; granted, seating's tight and tabs are pricey, but it's hard to beat when you seek a romantic dinner for two. to my perennially Paris-hungry sensibility, is the best French bistro the city has seen in a long time. There's an embarrassment of main-course riches at Le Gigot, served alongside an extraordinary repertoire of side dishes. If it's fish you're after, you may well not find a better bouillabaisse in the U.S. or even in the south of France. Ndiaye's upscale, medium-thick version is based on a shellfish stock so profound you won't need the accompanying rouille or grated Gruyere. It swims with succulent hunks of fish and tender crustaceans and bivalves. Two other great seafood dishes are built around grill-licked salmon and tuna. in deep, glossy, wine-kissed sauce. There is one sauced meat dish, though the restaurant's namesake that keeps me coming back for more: the Pernod-flambéed gigot d'agneau aux flageolets, featuring the startling paradox of medium-rare leg of lamb with long-cooked flavor. Possibly the best long-standing Village restaurant (and long-standing speaks volumes) that never disappoints. Great staff, great service, and absolutely fabulous fare. We have been dining at Le Gigot for at least 15 years, having spent birthdays, anniversaries, evenings out, and even a New Year's Eve or two. We've always loved it, and this time -- a birthday -- was no exception. The oysters were pristine, and the mains -- seafood risotto and the always excellent cassoulet -- were delicious. The small but very well-chosen wine list is always perfect. Best of all is the service. Although it had been some time since we'd last been at Le Gigot, the staff recognized us, heartily welcomed us, and treated us as if we were old friends. Merci beaucoup to the proprietress and staff. It was just perfect. Almost felt like I was back in Paris at a neighborhood bistro. Lovely service. Great food. Friendly ambience. One of those places where people just naturally talk to one another...table to table.